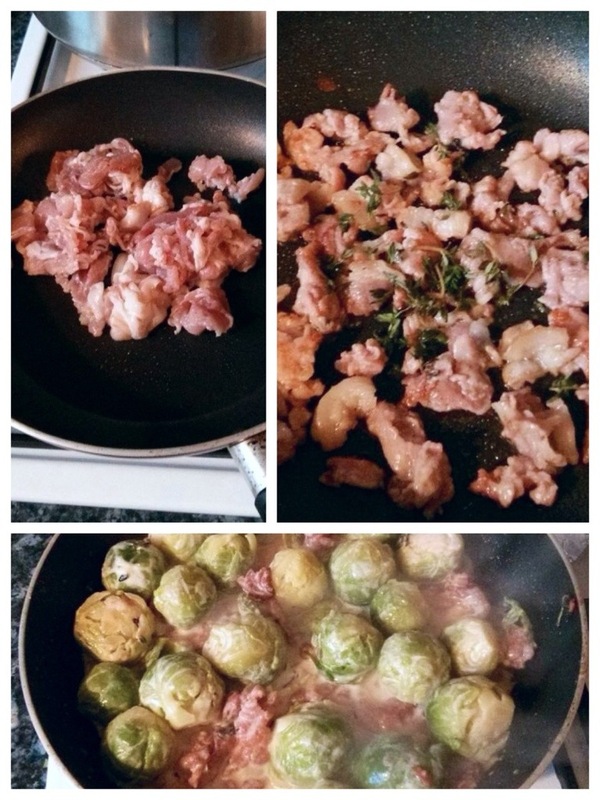 We had already partially decided that we wanted to make a Brussels sprout dish I made at Thanksgiving because we had some leftover bacon in the refrigerator – I know, it seems impossible to have leftover bacon, but we did. I didn’t bother to look at the recipe until just now as I write, and actually it’s the same ingredients but done slightly differently. Funny how recipes are seldom the way you remember them! I simply part-cooked the Brussels sprouts and then put them into an ice bath. Then when we were ready to eat I fried off the bacon, tossed in the sprouts, added a dollop of Dijon and crème fraîche and called it a day. Still delicious and half the faff! 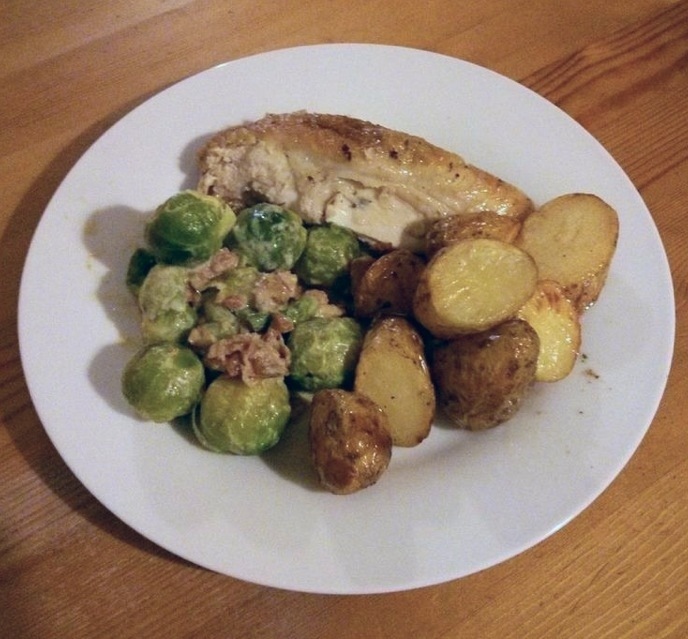 Anyway, we decided that chicken would probably best complement that dish, so away we went with our chicken, Brussels sprouts and potatoes which would be – inevitably – roasted in duck fat. Not ground breaking, but I have to give in to my husband’s, albeit sometimes uninspiring, cravings from time to time. Marriage is about compromise after all. After following Mark Sargeant’s poached and then pan-fried chicken breast recipe and seeing what wonderfully moist results it produces – not to mention the fantastic stock! 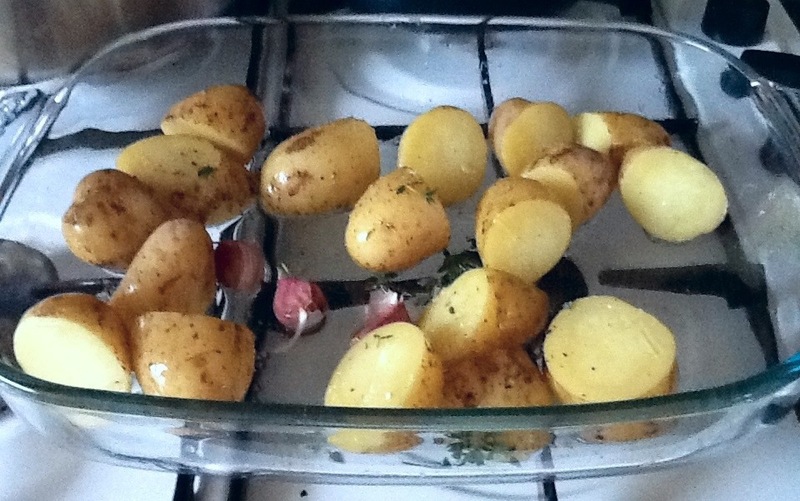 – I decided I would never roast a chicken in one piece again. However, as I wanted to cover this particular bird in herb butter I decided on another method which has always yielded equally moist white meat: spatchcocking (or butterflying) – I’m not sure which side of the pond calls it what. 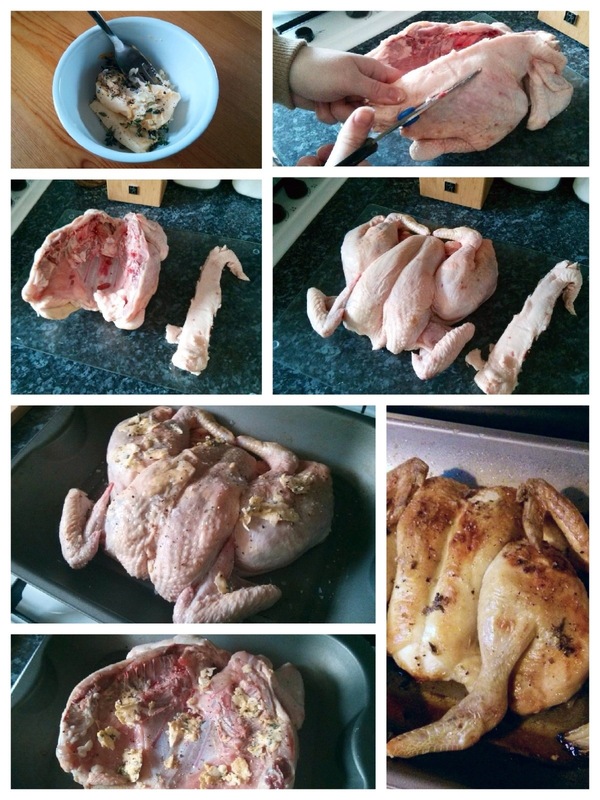 To spatchcock, or butterfly, a chicken you simply cut out the backbone (tail end first) with a sturdy pair of kitchen shears, flip the bird over and press down on the breastbone until it cracks and the bird is perfectly flat. This allows the breast and legs to cook evenly, so you don’t end up with dry breast meat and undercooked legs. At first I thought this method of preparation was only for barbecuing or cooking under a brick, but it’s just as useful for roasting. I took the backbone, some carrots, onion, bay leaf, peppercorns, etc and made stock, adding the rest of the carcass the next day after we had stripped the remaining meat – it wasn’t quite as rich as the stock made from poaching the whole chicken crown, and probably not worthy of chicken soup, but definitely good enough for cooking with. To make the herb butter I just mixed some thyme, Dijon mustard, garlic, salt and pepper with some room temperature butter, but obviously you could use whatever herbs, or mixtures of herbs, that you like. I spread this on both the underside and the skin side, getting it underneath the skin on the breast as well. I had hoped to slice some potatoes and onions and layer them up under the chicken so they would then be basted with this herb butter and chicken juices as the chicken cooked – sort of a chicken version of pommes boulangeres – but I was accused of only wanting to make ‘wet’ food and had to submit to duck fat roasted potatoes instead to meet the crispiness quota. As we hadn’t planned sufficiently ahead, I only had about 30 minutes to sit the chicken in the refrigerator to dry off, so the skin was not as uniformly crispy as I would have liked, but definitely still edible! I put the chicken in the oven at about 400ºF (200ºC) for 25 minutes, then basted and turned the oven down to 375ºF (180ºC) for another 25-30 minutes. It rested covered in foil for about 10-15 minutes and was wonderfully moist and tender. Thanks for the link Pami. Your chicken and brussel sprouts is our kind of meal. Looks delicious! I just need to get a proper camera so my pictures do the food justice! Our kitchen is a bit light deprived, especially as it’s always overcast in sunny England! I just learned the meaning of spatchcock!! Who knew that it meant the same as butterflying. Everything looks delicious, especially the Brussels sprouts with bacon! Thank you! I prefer the term spatchcock, it sounds full of intrigue and mystery! Like something out of MacGyver. I will be sure to use the word spatchcock from now on. I kind-of like it! I’ve never spatchcocked anything but now I know how – thanks! As for marriage we have fully developed the art of compromise when it comes to food – the wife is vegetarian and I’m not – so we do two versions of everything we eat! As long as it works for you! I couldn’t believe I was accused of being partial to ‘wet’ food though, good grief. A beautiful plate. Bet it was delicious, too.